Great sunny furnished duplex for a couple in the center - south. 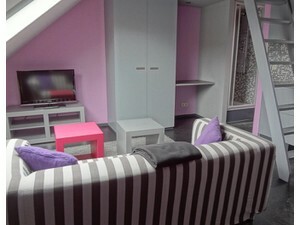 Cosy and modern apartment, in the heart of the hip, most trendy and popular area of Antwerp city centre, South. Surrounded by many cool bars but always quiet inside. Wifi available. FREE PARKING square very close. The south ('t zuid) is known for its vividness, and almost feels like a little village inside the city. We rent it for longer periods for less price. We rent it for shorter periods as well (please, ask for them). The price includes water, heating, gas, electricity, internet, TV, washing machine, bed clothes and towels. You just need to take your luggage. Soleado duplex en el centro - sur para 2. Está amublado y con cocina equipada. Precioso y moderno apartamento en el corazón de la zona más popular de Amberes. Está rodeado de muchos locales "cool" pero es muy silencioso. Tiene Wifi y se puede aparcar gratuitamente muy cerca. El precio incluye agua, calefacción, electricidad, gas, internet, TV, lavadora, sábanas y toallas. Sólo tienes que llevar tu equipaje. Alquilamos por periodos largos y cortos.